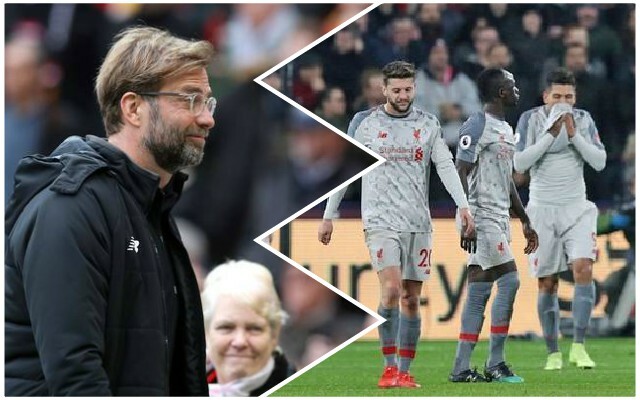 The Reds are still three points clear of Manchester City in the Premier League title race, but that did not stop a feeling of frustration emanating at the final whistle at the London Stadium. Sadio Mane’s 11th league goal of the season opened the scoring but poor defending from a West Ham United free-kick led to Michail Antonio levelling. Manchester City could go top of the table if they beat Everton at Goodison Park on Wednesday night, but would have played a game more. The match next Saturday at Anfield against Bournemouth certainly is now a must-win game. At the final whistle in London, this is how Reds fans reacted to the result. Worst thing about the recent results is the sloppy errors leading to goals. Earlier on in the season, we score early and then win that 1-0, that’s not happening at the moment. Never deserved the win there. Worrying performance and the lack of squad depth very telling with so many injuries. Still, three points clear at the top, which is absolutely wild considering how I feel right now. City firm favourites now in my opinion, but we go again! It's so frustrating to see them play like that, when we all know how good they can be. All I would say is that having a dip with 12-15 games to go is slightly better than 2-3 games to go. There is time to recover. Perspective is, of course, needed – the Reds did not win but West Ham were excellent and it is another point picked up with 13 games remaining. Hopefully, Jordan Henderson, Gini Wijnaldum and Trent Alexander-Arnold will all be fit for the Bournemouth game – if they are, it could be a very different Reds display.